DC Universe Classics Wave 19: 5 Guys, A Girl and.... a Baby on the way?? 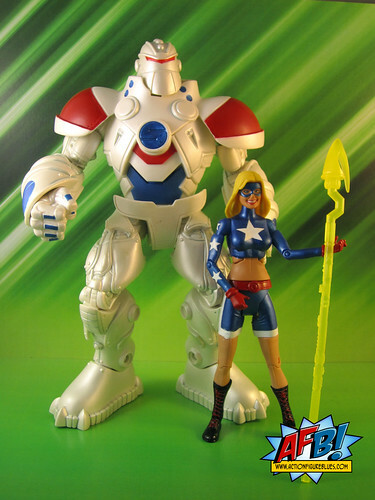 The Death Knell may have tolled for retail waves of Mattel's DC Universe Classics as we knew it, but I still have two waves to work through and review, starting with the JSA-themed DC Universe Classics Wave 19, which came with a S.T.R.I.P.E. Collect & Connect figure. This is a wave of quite high highs and very low lows which sums up the legacy of DCUC perfectly. It adds some much needed characters to the 6" DC Universe, but also delivers some lesser lights, and what is my view is one of the most horrid figures in the line. The Golden Age Sandman is the winner of the wave in my eyes. 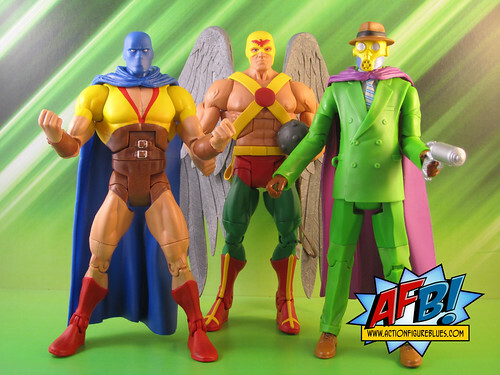 DC Direct delivered two versions of the JSA’s Sandman in their earlier days, and while these were welcome figures, the sculpt was quite a stylistic one that didn’t necessarily mesh well with later figures. This figure, therefore, is a very welcome addition to the DCUC JSA. The sculpt is dead on, and while there is an existing “suit” buck out there for this line, there are some stylistic differences between this and other figures that have used it. His mask and hat are beautifully sculpted, as are his tie and and cape. It’s all supported by a great paint job with great colour choices. This is a great example of what Mattel and the Four Horsemen did with this line when they did it well. 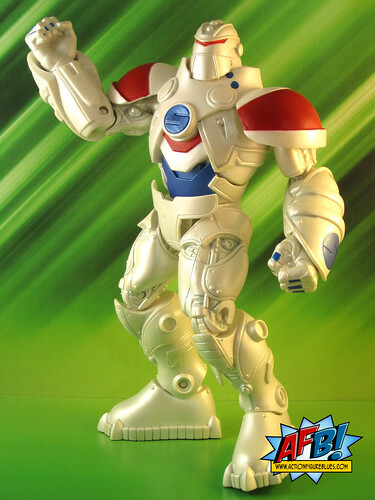 Next up is the Golden Age Atom, who really is a sight for sore eyes, which were made ever so much sorer by the mini-monstrosities that DC Direct tried to pass off as GA Atoms some years back. The DCUC Atom is a tad taller and bulkier than I’d like to see, and I do have to wonder why the smaller male buck wasn’t put to use here, but after DC Direct’s Tiny Terrors I’ll settle for something on the slightly larger scale. 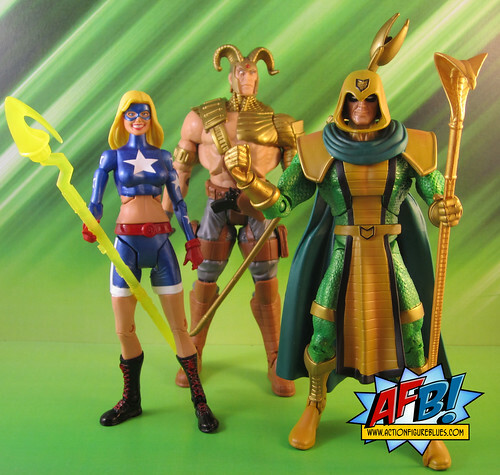 The sculpting and paint is solid here, and while I don’t see Atom winning any figure of the year polls, he does make a great addition to the DCUC JSA. I’ve criticised the DC Direct versions of some of the other characters in this wave, but DCD’s recent effort with Kobra was quite a good one, which takes a little wind out of the sails of the DCUC version for me. It is a great effort, no doubt. A great looking figure with some nice reuse of different parts and then some custom sculpting on top. Nice to have in the DCUC line, but not as exciting as a brand new to plastic character would have been. The JSA version of Magog isn’t a figure I ever felt I needed, but he’s here in this wave, and for what it is, he's an adequate representation. Unfortunately, I can think of so many JSA characters that could have better filled this spot that it's hard to appreciate the figure on its own merits, and I have to begrudge him all of the custom tooling he’s had. He has his staff to hold, but his weapon is sculpted in to the holster. I will say that I'm happy to replace by DCD Magog with this one for the simple fact that the DCD version is one of my most chronic faller-over-ers, and often takes out the whole JSA with him when he goes. Unfortunately, it's left to poor old Stargirl to carry the tag of not just the dog of wave, but quite possibly the line. It’s not news that the DCUC female buck really isn’t great to start with, and unfortunately this figure is one that really shows up the issues with the cookie-cutter buck approach. The lower abdomen and hips of the female buck are quite wide, and the painted-on bare midriff makes Stargirl like like she’s either expecting or really needing to hit the JSA gym. I really find it hard to imagine people sitting in a QC meeting (I mean, I’m sure they have those, right?) and thinking that this looked any kind of okay. I suspect this figure is going to be a big disappointment to fans of this character, and it's a bit symbolic of the issues with this line - the times when you know the figure could have been so much better with a little bit of thought and adjustment. S.T.R.I.P.E. borrows somewhat from the Stel CnC from Green Lantern Classics, but gets a fair amount of his own tooling as well. I had quite a bit of trouble getting his head to connect to the torso, and had to do a “boil and pop” in the end. It’s the first time I’ve ever had any kind of issue with putting a DCUC CnC together, so I guess that’s a pretty good run. You can see more pics at Facebook, discuss this at the AFB Forum, or comment below to enter the February AFB Comment of the Month Contest! 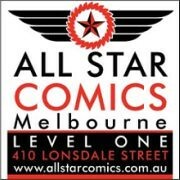 Also, please don’t forget to check out the brand new AFB Podcast - Episode One is up at iTunes now! That female buck works even less on a teenager. Blecch! For me another significant problem is that stupid grin. Worse than the faces on JSA Green Lantern and Obsidian, imho.